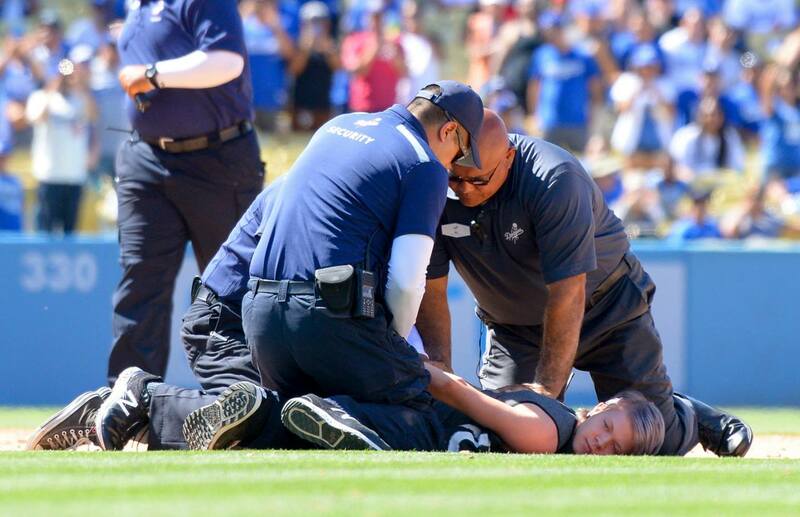 LOS ANGELES–A group of five activists ran onto the field at Dodger Stadium Sunday carrying messages of compassion for farmed animals. The disruption, staged by members of the non-profit organization Direct Action Everywhere, aimed to persuade the Los Angeles Dodgers organization to stop selling Dodger Dogs, the team’s signature hot dogs. This undercover investigation and open rescue at a Hormel factory farm that makes Farmer John meat products, including Dodger Dogs, reveals the sordid and brutal conditions animals live in prior to being killed to make the hot dogs. It is not “foolish” to pitch compassion to the conscience of people watching a baseball game and the Dodgers corporation that support animal abuse. It’s strategic and has the potential to change individual decisions and corporate practices. It is only perceived as foolish because our society has been programmed to comply. It is labeled foolish to quell resistance. Corporations that profit from oppression depend on people’s apathy and belief that the status quo can’t change. In fact, these potentially game-changing acts of courage in the face of merciless corporate immorality and ruthlessness can remake that narrative and deserve support. Direct Action Everywhere is requesting that the Dodgers stop selling animal products, support equal rights for all animals that includes freeing them from captivity and harm, and publicly condemn violence against animals. Major league ballparks across the country are making the transition. The Philadelphia Phillies, for example, serve a vegan chicken-steak sandwich, an Italian vegetable grinder, veggie dogs, and black-bean burgers. Americans will eat an estimated 150 million hot dogs on the Fourth of July. Use your voice! Help save farmed animals. 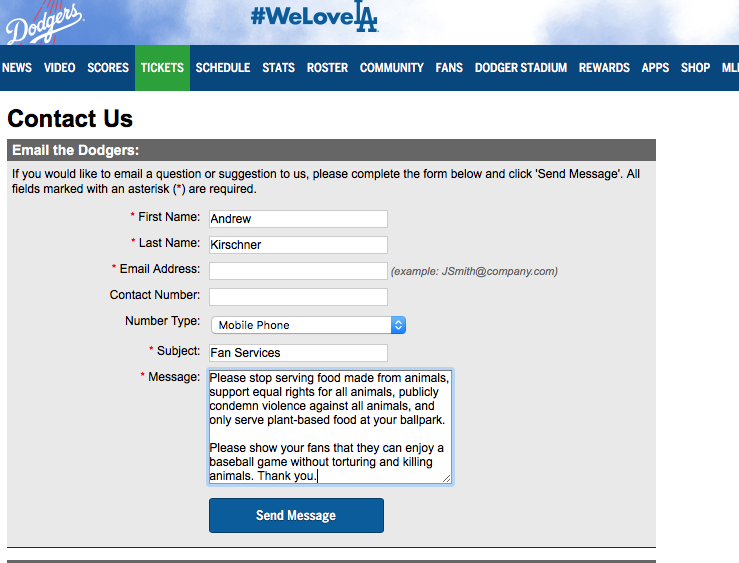 Please contact the Dodgers and ask them to remove animal products from their menus. Great article on showing the magnitude of animal abuse in the major sports arenas. I sent a tactful message to the Dodgers in protest of their menu. Thanks for your awesome blog and for keeping the message out there. I often quote you, mr. Kirschner, as you always put things in perfect perspective re the toll on innocent animals for humans sake. Very kind of you Lesley. Thank you for taking action. I appreciate your activism for animals. Thanks for making it easy to contact the Dodgers – I sent them a polite but firm email. Thank you Carolyn. I appreciate you taking the time to express your position. All animal right activist are a bunch of communist!! Why is it that they don’t have a problem with an animal killing another animal for food do they ever watch Animal Planet when I laughing hyena kills a zebra?? How do you think people feed their dogs and cats?? Is it a fact that Purina uses animal products to create dog food and cat food?? Get over it communist it’s called the circle of life and it’s called the food chain deal with it just because you don’t want to eat meat doesn’t mean we should follow your damn lead!! You may find the article below helpful as it addresses your question about the food chain. In terms of animals killing other animals, that’s what they do naturally. They don’t have grocery stores and restaurants that sell other options. We do. Dogs and cats are different from people. From your post you probably eat a lot of cows; so it’s best to have yourself checked for colon cancer often. Secondly, what does one’s dietary preferences have to do with communists? Wait – don’t bother to answer. Any data on how disruptions actually affect consumers’ behavior? If they truly do move people to spare animals, great, that would be the thing to do. I can’t help but have a strong suspicion that when people are invested in an event that is disrupted by someone who thinks that what they have to say is more important it decreases sympathy for animals. We are not our audience.